FUJAIRAH, 14th November, 2017 (WAM) — The Fujairah Municipality has signed a Memorandum of Understanding, MoU, with the city of Rotterdam in Netherlands, under the framework of promoting mutual co-operation, exchanging knowledge and achieving sustainable industrial development in the oil sector. The MoU was signed by Mohamed Saif Al Afkham, Director-General of Fujairah Municipality, and Ahmed Aboutaleb, Mayor of Rotterdam.The MoU stipulates that Rotterdam will assess its industrial facilities that refine and store oil and its derivatives, as well as its facilities that process oil waste products and its metal industry facilities, to comply with the latest technologies and best international practices and reduce the negative impact on the environment.The MoU also aims to raise the capacity of the Fujairah Municipality Air Quality Control Network and introduce modern technologies, which are similar to those that monitor and track operations in Rotterdam (E-Noses). 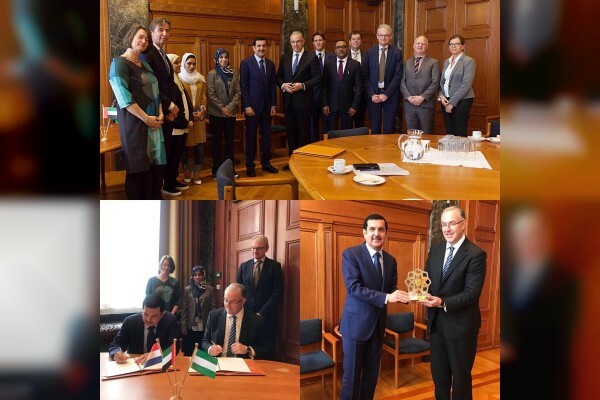 It also aims to establish a local monitoring and control room, and Rotterdam will provide support to the Fujairah Municipality to develop legislation and guidelines for these activities. Al Afkham stated that environmental authorities in Rotterdam and Fujairah face similar challenges in terms of developing their oil industries near residential areas, which affects local air quality. Therefore, the Fujairah Municipality is seeking to implement best practices and latest technologies while simulating the sustainable environmental management system that is used to monitor relevant processes.He also highlighted the importance of strengthening the concept of environmental responsibility as a modern administrative process, with the aim of protecting the community and the environment from pollution. Aboutaleb affirmed the importance of co-operating with the Fujairah Municipality, which will help to achieve sustainable development in ports and oil industry zones around the world and reduce their carbon footprint, in line with Paris Climate Agreement in 2016. The UAE and Netherlands are among the countries that signed this agreement, he added.